This thick and hearty Beef Stew is a one-pot meal that is much more quick and easy than you might at first think. It only requires a few simple ingredients to prepare and although it has a lengthy cooking time, it’s a great way to cook up supper without a lot of fuss. Slowly simmered to bring out all the flavors, you can sit back and relax while this one cooks. Your family is gonna love it. We’re about to wrap up winter here in the south so I wanted to get this recipe online during these last days of cool weather. OK, 80 degrees for the past several days…isn’t cool weather, but I think we’re still going to see a few more cooler days ahead before Spring actually arrives. The trees around where I live have already burst forth in full bloom and look like they are covered with snow. Just yesterday, I started seeing some green leaves appear as well. I love spring, but over the past few years, I’ve been really hit hard with allergy problems. I never had it until about 2009 when I took up fishing and started spending lots of time outdoors. Problem is, it just seems to be getting worse each year since. Still, I love this time of year….don’t you? Beef stew is not just a winter meal, don’t get that idea OK? It’s great any time of the year. Its just that this recipe is kind of thick and it makes a great meal all by itself on a cold winter day. The heartiness of the meat and potatoes alone, slow simmered in broth, will both fill you up and warm you up. You would have normally found Beef Stew served up for Sunday dinner at my house. Mama would cook up a great big old pot full, about 3 times as much as this recipe will make. She would then let it slow simmer for hours on the stove until it was all just right. It was only later in life that she acquired a slow cooker – or – crockpot, so my memories are of that big old aluminum pot she liked to use. As I’ve mentioned in some of my other stories, we always had about 10-15 people at our house for Sunday dinners. It was a time when all the family got together and usually included our pastor and his family as well. My brother and sister were both married with new families of their own, and if they didn’t show up for Sunday dinner, Mama would call them to see if they were on the way….or why they weren’t….on the way. Gotta love it. Being a widower now for going on 14 years, sitting at home with a table of one….just isn’t the same. I guess that’s why we look and refer to them as the “good old days” now. But, for me, cooking up these old favorites can bring back a full rush of happy days from years gone by. Days when I had my eye set on that one pastors daughter, just wanting to be around her and realizing that my whole reason for going to church was just for the chance to sit with her while her father preached down fire and brimstone. Days when I hoped mama was going to invite them home for Sunday dinner and maybe….just maybe…she and her brother would stay the afternoon while her mom and dad visited with some other members of our church. Of course, there are lots of other Sunday dinner memories in my head, but I’ll have to save those for later. For now, let’s get this pot on the stove and cook up some good old southern comfort food. If you’re ready…Let’s Get Cooking! 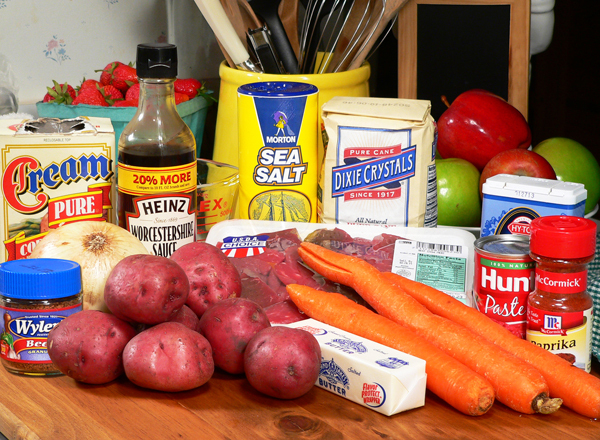 Beef Stew Recipe: You’ll need these ingredients. 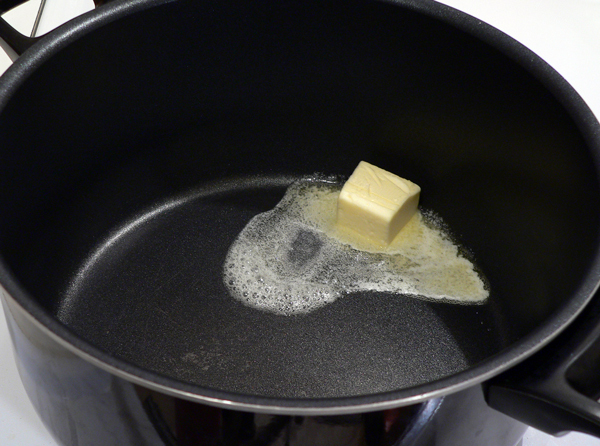 We’ll start out by melting about two Tablespoons of Butter in a large pot set on medium heat. While the butter is melting, slice up your onions. 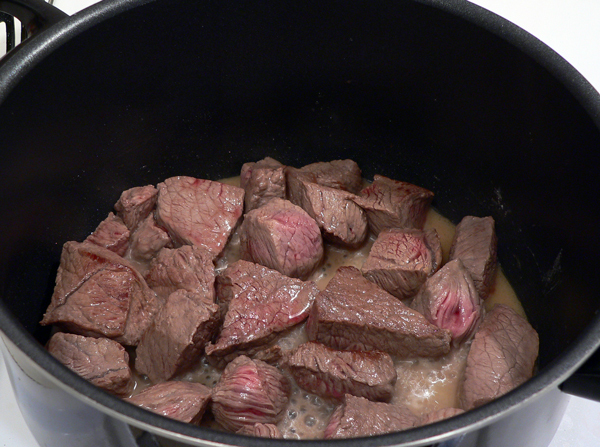 Toss the beef cubes into the pot with the melted butter. The beef used here is boneless, pre-cut cubes that are easily found in your local grocery store. It’s usually chuck or round that has been cut into 3/4 to 1-1/2 inch cubes. If you can’t find them already cut, you can do it yourself very easily. Just select any chuck or round cut…except for top round…and just trim off the fat and cut it into bite sized pieces. Brown the beef in the butter. 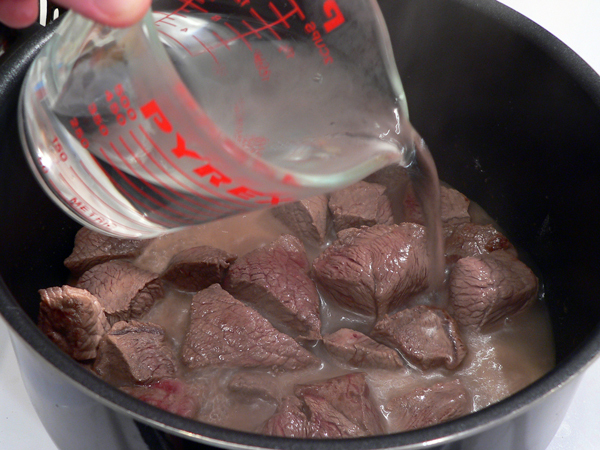 Some recipes call for tossing the beef cubes in flour before you add them to the pot. I don’t think it matters all that much and just toss them into the butter. I’m going to let them cook a bit until they start to brown but not get a brown crust on them. Just stir them around every few minutes and let them cook. This will take about 6-10 minutes depending on how hot the pan is. 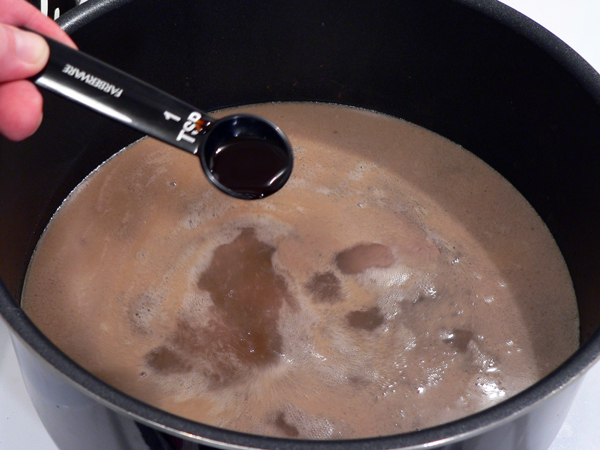 When the meat has browned, pour in 4 cups of warm water from the kitchen tap. Add the teaspoon of Worcestershire Sauce. 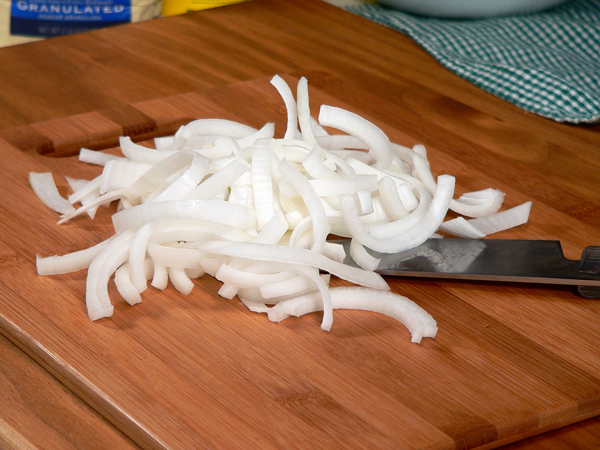 Toss in the sliced onions. Add one teaspoon of sugar. Mama used sugar in just about everything. I come by it naturally I guess. Add one half teaspoon of Black Pepper. Add one half teaspoon of Paprika and stir all the ingredients together. 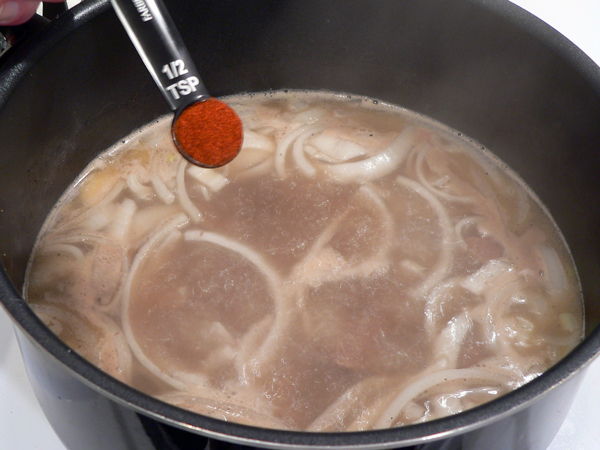 Place a lid on the pot and let it simmer. 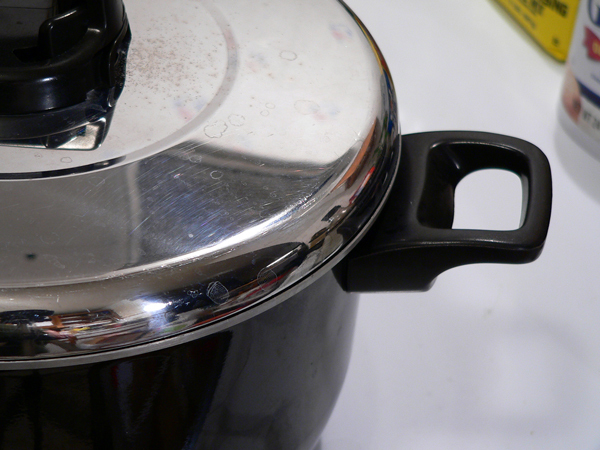 I open the vent on the lid of the pot to let out steam as it cooks. You’ll want to lower the heat down to about half way between your low setting and your medium setting on your stove. You don’t want it to cook at a rolling boil, just a low and light simmer. It will cook this way for about an hour. Just check it about every 20 minutes or so and give it a stir at the same time. 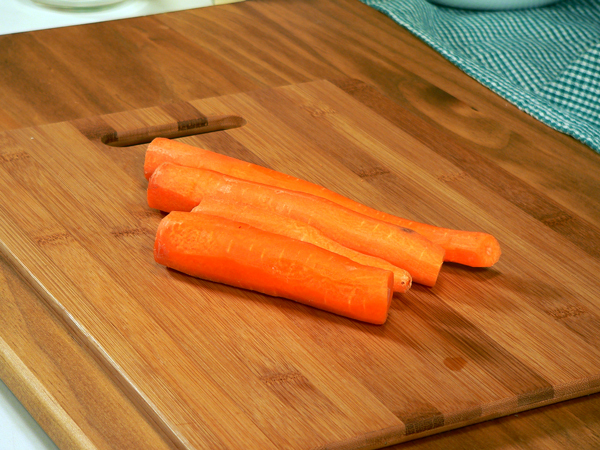 While the meat is simmering, go ahead and wash up a couple of carrots for slicing. 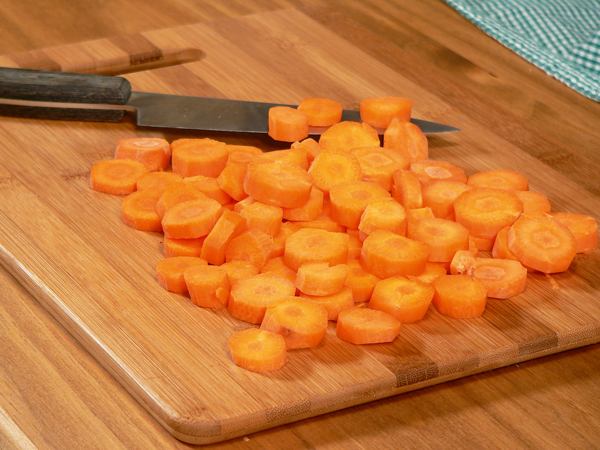 Slice up the carrots in about 1/2 inch rounds. You want good bite sized pieces here. Baby carrots would also work, but I even slice those up smaller whenever I use them in this type of recipe. 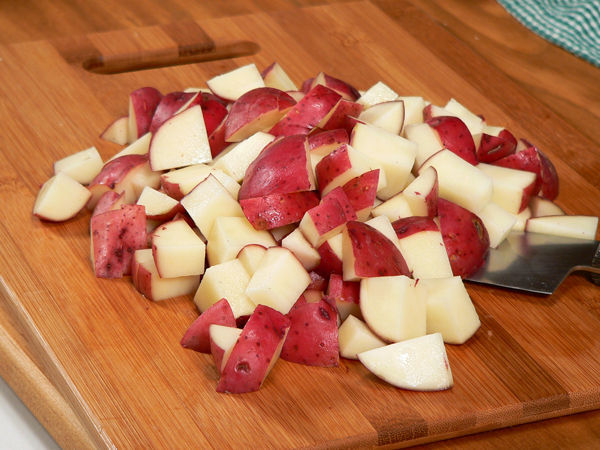 Scrub down the potatoes and prepare them for cutting. Quarter and dice the potatoes. Try to cut them into uniform sized pieces so they will all cook up about the same. When the meat has simmered down, it’s time to start adding the other ingredients. Add in the sliced carrots. Toss in the diced potatoes. 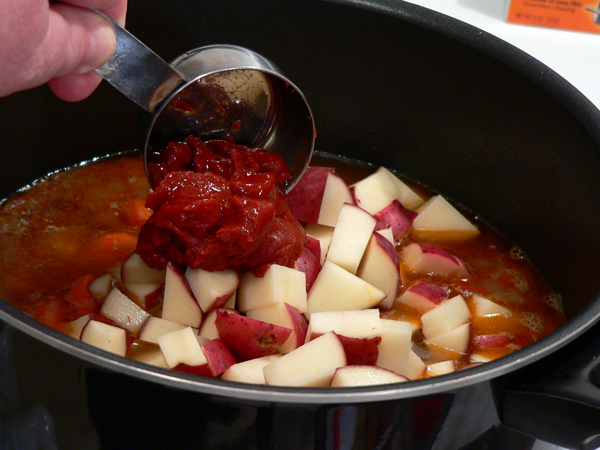 Add in the Tomato Paste….then stir it all up real good. Add in the Beef Bouillion Granules. I like using the granules because they are much easier to work with as opposed to those cube things. The cubes take a long time to dissolve in my opinion. Seems like no matter how much I stir, sooner or later, I’ll see a piece of one of the cubes floating around in the pot. 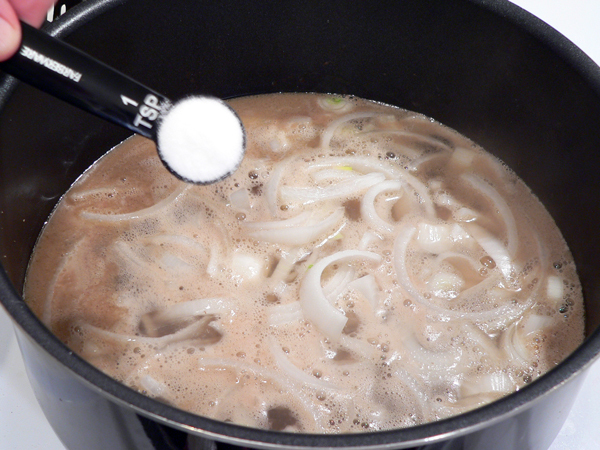 Of course, beef broth would also work very nicely, especially if you have home made. We added 4 cups of water in the beginning so according to my jar, I need 4 teaspoons of Granules to make 4 cups of broth. 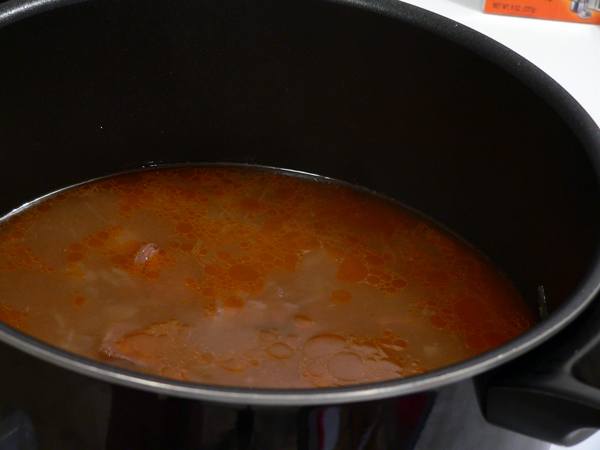 Cover the pot once again and let it all continue to simmer over that medium-low heat. Check on your stew about every 20 minutes or so. 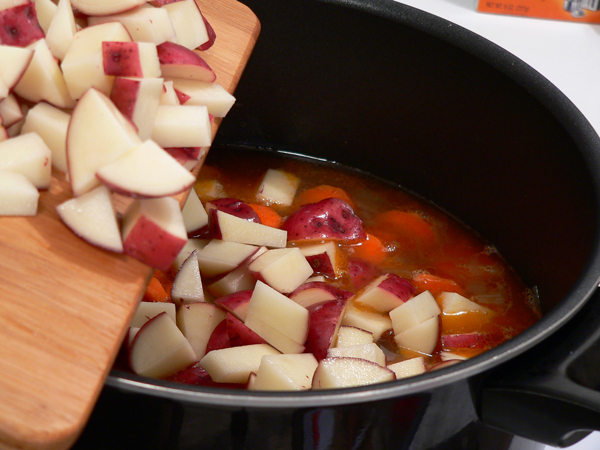 It will take about 30-45 minutes for the potatoes and carrots to cook until tender. I like mine with just a little bit of a “bite’ left in them. The longer it cooks, the more mushy the potatoes will become. You’ll just want to keep a close check on it after you add the carrots and potatoes and cook it to your personal liking. This is a great meal to prepare ahead of time, warm up and serve later. If you’re doing that, don’t overcook the vegetables because they will cook even more once you warm the stew back up before serving. 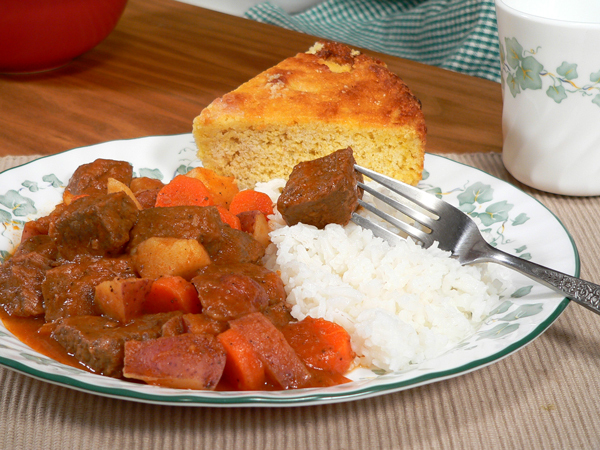 Serving Suggestion: Beef Stew is certainly a meal you can serve all by itself, but I really like it along side some cooked white rice and a piece or two of homemade corn bread. It just doesn’t stay beside the rice for long. I stir it all up together and eat it that way. If you wanted to stretch the meal, either stir in some cooked rice or just let the rice cook during the last 15-20 minutes or so while you’re simmering the stew. You’ll find lots of variations of Beef Stew here on the internet. Some add green peas, celery, string beans, tomatoes, or even mushrooms. I’ll just save all that stuff for the homemade vegetable soup. Give me this basic meat and potatoes version any old time. I do hope you’ll give it a try and let me know what you think. Enjoy! This thick and hearty Beef Stew is a one-pot meal that is much more quick and easy than you might at first think. It only requires a few simple ingredients to prepare and although it has a lengthy cooking time, it’s a great way to cook up supper without a lot of fuss. Slowly simmered to bring out all the flavors, you can sit back and relax while this one cooks. Cover again, simmer for about 45 minutes or until potatoes are tender. Serve this Beef Stew in a bowl by itself for a hearty and delicious meal..or…serve it alongside some rice and cornbread to stretch it out even further. Your Comments: One of the things that will help our website grow and find more readers is for you to leave us a comment. Even if you just say Hello, we’re always glad to know that you stopped by for a visit. It only takes a minute or two. Compare that with the literally hours it takes to put a recipe together here on the internet, and hopefully you want think it’s too much for us to ask. I’d really like to know when and if you try any of our recipes and trust me….I sincerely appreciate your comments on them all. And, in case you’re wondering, we hope you’ll leave a comment on EACH of our recipes. You’ll find a new one each and every Monday morning right here on Taste of Southern. I grew up in Gaston County NC in the 60s/70s and my Mama, of course, made the best beef stew. I’ve never been able to duplicate it, but let me tell you, I followed your recipe to the letter (except I did flour the beef chunks), and it is delicious! Second only to Mama’s. I live alone, and it’s all I can do to keep from eating the whole pot tonight. I live in Seoul and will freeze up single serving portions (large ones) to enjoy on the freezing nights to come. I may even indulge for breakfast. Thanks for the great recipes. A great surprise was your pizza dough (pizzas my favorite too!) which I’ll summon up the courage to try soon. Thank you for sharing this recipe AND your memories. This is my go to beef stew recipe. It’s just delicious. I wouid love to sit at your table, sharing a bowl of this stew and hearing some more of your memories. I’m making the beef stew again today. Michigan has had a rough January and February so far and this will definitely help cope. I hope you are well. Great recipe!! Family loved it! Made 2 little changes, used beef broth instead of water and was out of tomato paste so I omitted the sugar and added a bit of ketchup. Still turned out well! I’m excited to have a new addition to our dinner rotation! Amazing recipe! Everyone loved it!! Thank you! I don’t cook, other than grille. Thought I’d like to try a beef stew like my mother made and came across this recipe. Sounds doable for someone like me…already printed out the recipe and the ingredients I need. After reading the comments I’m now really excited to see how this turns out. Thanks! You make your beef stew just like I make mine. only I like adding a package of onion soup mix instead of the onions. and I usually use the beef broth depending on what I have on hand. This is my go-to recipe when I make beef stew; I’ve made it a bunch of times and it’s always a favorite, thank you! I’m making my second pot of this great stew! Wanted to thank you so much for a wonderful stew recipe, the meat was so tender and moist. We enjoyed it and will be our recipe from now on. We also tried your pork chops and they also were great. Thanks for taking the time to post your recipes. I never cook, but today since its cold and icy outside i decided to have a look for a nice stew and found this website got it simmering away and omg it smells delicious! Im sure we will all love it. I am looking for low calorie low carb recipes as im getting bored eating the same things. If you could recommend some recipes id appreciate it. Hey Steve, I love this recipe! I just have a quick question; the recipe says that there are 6 servings in this dish, and I was just wondering, about how many cups is one serving? Thanks! Next time add some dumplings on top about 15 to 20 minutes before the stew is ready. I always Cook the Meat Longer to make sure My meat is TENDER before I add the Vegies. or use a Pressure Cooker. . Only because Not all the Meat is a tender Choice. Then I add my Vegies & cook til tender. perfect every time. . . . SOUNDS SO GOOD, THINK I WILL MAKE IT TONIGHT!! This is my go-to beef stew recipe with its simple, basic ingredients. I add 2 tablespoons of instant tapioca to thicken it. My whole family loves this! I have tried this beef stew and it is delicious. It is easy and turns out every time. I have a pot of this stew on now. This is a winner!! I absolutely love your stew recipe. I was raised by my grandparents and this stew is exactly like the stew my Grandma made ! Thank you so much for sharing !! Now in my late 20’s, I cook this for my husband and he LOVES IT! I add some peas and a little Tony’s Chachere’s to give it some spice and boy does it turn out extra tasty ! After much searching, I found this to be the best recipe for a classic beef stew, especially since no oven is required. 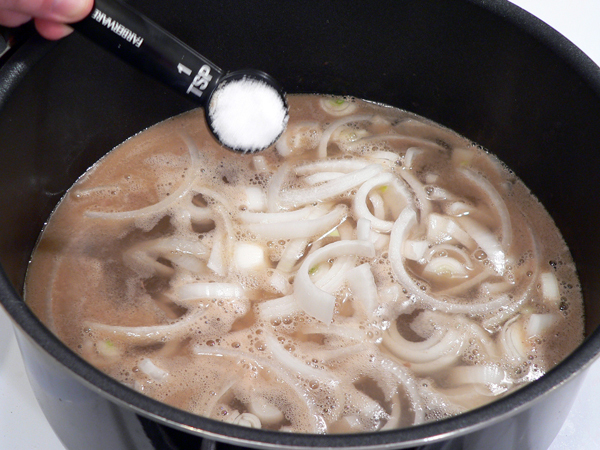 I decided to also add a clove of garlic in with the onions and it certainly added a bit of extra natural flavor. The finished result was adored by everyone in the family. However, I did find that it had a bit too much of a tomato flavor. Perhaps it was because I marinated the steak in a dry red wine first. When I reheat the leftovers I think I will add a bit more beef broth which will return it to a more beefy flavor. Otherwise a fantastic and simple recipe. I look forward to making it again. Thanks! This Beef Stew recipe was easy to follow and easy to make – and i do not like to cook! It tastes great and I will be making it again. Thanks for sharing! And celery. I always put celery in my beef stew. And maybe a chopped tomato or two if they are in season. You look almost identical to a friend of ours here in Coshocton, Ohio! He has to be your long lost twin. This recipe sounds delicious also. I am making up a grocery list and I am going to add ingredients to make this recipe. I made this today for dinner tonight. The recipe was quick and simple and easy to understand. My wife really enjoyed the way it turned out! I’ll be making this again but will double the recipe to have more leftovers. I was in the mood for beef stew since the weather feels more February-like rather than temps in the 70’s that we had over the weekend. Gotta love Indiana. I have a package of frozen deer meat already chunked that needs to be used up, so I think I’ll substitute it. Maybe brown it in some bacon grease to kill that gamey flavor. It might not be gamey, since the deer around here eat well on the soybeans and corn grown close by. If I used the canned deer meat from last year, one would never be able to tell the difference between it and beef. Only problem with that is my hubby can’t get passed the look of meat in a jar to eat it. I’ll do it the long way. Keep the recipes coming, friend! With your help I realize what my stew has been missing looking forward to making the next one. Hello there! Happy day to you. I made Beef Stew recently, but I want to try your recipe before it gets too hot here in Florida to eat it. (Just seems to me it’s a cold weather dish). 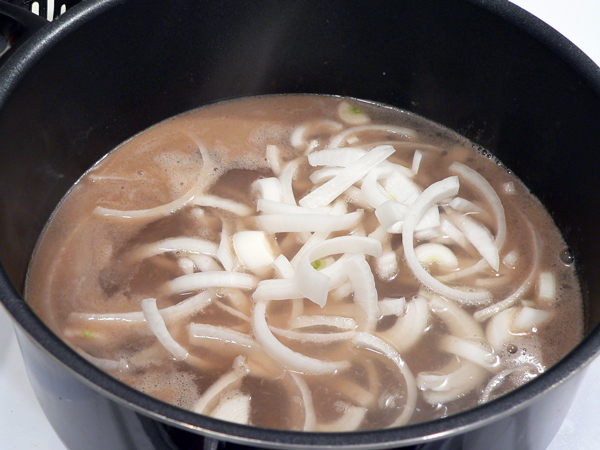 Regarding the question and answer you gave for the cornstarch – I always use it because I like to make lots of gravy (sauce, whatever you call it) so I use it to thicken it at the end of cooking time. 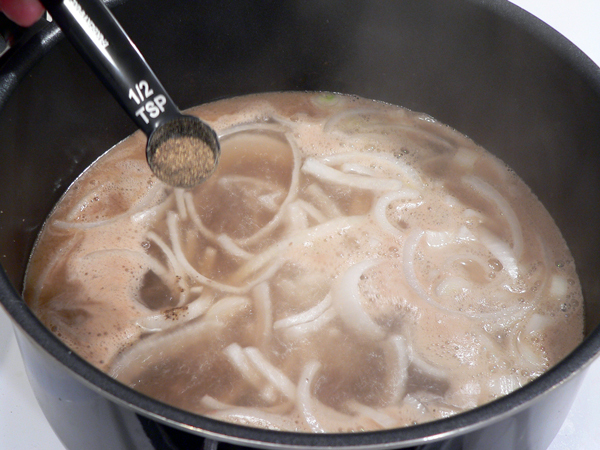 Just be sure to mix it with a little cold water before stirring it into the stew or you’ll have lumps in your stew. Cook a few minutes longer after adding the cornstarch/water mixture. Steve, your recipes are simple and popular. Gonna make the stew this weekend. It is much colder here near Toronto; last week was around zero degrees F. Brrrrr, need some stew! Thanks. My father-in-law had foot surgery yesterday. He LOVES homemade beef stew, a true southern cowboy (boots, horses, and all). So, (being the good daughtet-in-law that I am, lol!!) I decided to make him a pot. A southern gal myself, I have made many a pot of stew, but I enjoy trying new recipes. Always on the hunt for a good ole’ southern recipe, like momma and grandma used to make. While searching for another awesome southern beef stew recipe, I came across your website. I thoroughly enjoyed reading about your memories of your momma’s Sunday dinners (your Southern Collard Greens recipe, can’t believe you don’t like them!?!?) To make a short story long, I have your stew on the stove now simmering. From all of the reviews, I am sure he will LOVE it. It smells so good, I may have to sneak a little bowl for myself, shhhh. Now, to search for a good ole’ southern biscuit recipe to go with the stew. I’m sure you have one posted on here somewhere. And I will definitely be making those collard greens because we Alabamians love our greens! Thanks so much for sharing your wonderful recipes and the memories you have of a good ole’ southern upbrining! I followed your directions and the soup looked exactly like the photo! The pictures made it much easier as I learn best visually. The soup was really good. I added more salt, pepper, garlic salt (by accident) and garlic powder to it. I also added some frozen peas which I cooked on the side, drained and then put in with the rest of the stew. The beef, potatoes and carrots were perfect! I’m confident I can make anything now! This should be on the menu at a restaurant! I tried this recipe today and my usually picky eater boyfriend loved it! I added some celery and substituted chile powder because I didn’t have paprika. It was a hit! Glad I tried this recipe. I’m adding it to my weekly menu. I’m in the process of cooking this for my daughters and my husband right now and they say it smells so good. I’ve cooked it before but I wanted to try new ways of doing it. I didn’t use Worcestershire sauce or granules because i didn’t have any but hopefully it still comes out great. I’m from MS and I love southern recipes. Hiya all! If you are an outdoors person, venison works great in this recipe, it was Yummy! I’m going to make this sometime this week and was wondering if I can use a can of diced tomatoes? Hi steve can I substitute the paste for catsup? Out of tomato paste. I have been wanting a good beef stew recipe for quit a while. Well I don’t really like beef, but I can remember my moms beef stew. I am getting older and now want more of that home cooking to start sharing with my children, now that they are older. I want them to have something to share with their families. I looked and searched many websites before I went with your recipe. I am preparing this meal for my family tonight, and I hope they love it. It smells delicious and I have only started the meat and onions. I can’t wait to try this meal. I am going to make cornbread with it also to make it last. Thank you for having this website and giving great instructions on how to prepare the meals. I love it so far. Love the sound of this recipe, and plan on making this tonight! One question though, would it be acceptable to use beef broth instead of the water and granules? I’ve never attempted a stew before and would love any advice. Thanks! Steve, I just wanted to drop you a line to let you know that I’ve made your Beef Stew recipe a couple of times and it always turns out great! For years I used a certain brand name packaged seasoning but in search of a more healthy recipe, I found your recipe. It certainly fits the bill perfectly! Thank you for sharing. I am a single dad raising two girls on my own for the most part. I work 12-14 hours a day. It is very refreshing to find such a great recipe, easy to follow and best of all that TASTE WONDERFUL. Hi there! I came home sick from work today and all i could think about on the way home was how good a nice stew would be. So I googled stew and this came up. All the wonderful comments inspired me to give it a try. Can i just say YUM!! So good. And perfect for a sicky like me. The best part? I have enough left overs that i won’t have to cook tomorrow either…Which means i can be sick in peace lol. Thanks for sharing!!! Ok, I live in Indiana where stew is a winter staple. I have always made beef stew, but could never really get the texture or consistency I wanted – thick and robust. I used Better Than Bouillon instead of the granules. If you haven’t tried it you must. It makes SUCH a flavorful difference is soups, stews, etc. So tasty! Really enjoyed making it. Made the whole house smell great! Made some homemade cornbread to go along with it! Food for days!!! Thank you! I made the stew last week it is so good . It is so easy to make . Thank you . I made this today. The only thing I did different was I seasoned the meat before cooking. I also lightly cooked my meat in olive oil. It came out great! Going to try this recipe tonight for my husband . With the cornbread and rice. He is from the south so I’m hoping he likes it. I will let you know. Well did he like it? Lol did you do anything different? Tried your recipe and it was FANTASTIC! My husband and I LOVED it. Here in Hawai’i, we have our own way of making beef stew, but one night, I decided to Google different recipes. I came across yours and tried it out. I did add some Italian seasoning for a little more flavor, though. Served it alongside white rice and macaroni salad (the staple here in the islands). All in all, it was FANTASTIC!!! Going to make it again tonight. Hi Angela, Greetings from North Carolina. I’m happy to hear that you enjoyed the Beef Stew recipe. Thank you for trying it. I’d love to see YOUR recipe for making beef stew, and for the macaroni salad. If you’d like to share, just email them to me via the Contact Page on the website. Thank you in advance. I’d love to learn more. I just came across your recipe for beef stew and my mouth is watering just looking at ingredients and simple instructions. I intend to make it later in the day. I just made this and it is a hit!! I poured it over white rice and I do believe there will be no leftovers. Great for those cold nights and a great meal to make without having to stand there and watching it cook worrying if you are going to mess it up. When I made this I did not have Worcestershire Sauce, instead I used A1 steak marinade sauce instead. Turned out great! This one is getting put into my recipe box and passed around! Thank you!! I just love this recipe. I make it all the time now. Thank you. Cooking it right now, and my 4 year old says it smells soooo good. It is just starting to snow, looking forward to enjoying this comfort food during this cold weather. Thanks! I tried this a couple of days ago, and it was delicious! The beef was cut a bit too large, and I went a bit heavy on the tomato paste, but those are little teething problems that I can adjust for next time. Thanks very much for a simple, clearly explained and lovely dish. 2nd Time Ive made it in 3 weeks. Awesome both times! Thanks Steve! AND I had to add some of my grandmas’ secret cornbread. What a great recipe for a cold night in Tennessee. I am going to cook it now!! ABSOLUTELY FABULOUS! When I asked my husband what he wanted for his Valentine meal, he said, “That Awesome Beef Stew” you make.Thanks Steve for your recipes and the stories. And this stew is sooo goood! Anyone can make this perfect stew. Steve is a seriously fantastic southern cook. And the directions are perfect, the preparation is easy. Go ahead and get a big bowl. ‘Cause otherwise you’ll be going back for seconds. i will definitely try your recipe, im sure my hubby and kids will love it! This recipe looks great! I’m melting the butter as we speak. Can’t wait to taste it. Decided to make a Beef Stew to go with the cold weather. I must say that this recipe is by far the BEST Beef Stew that my FAMILY has ever HAD!!!! Me and my Husband were really surprised as to how simple the recipe was to follow and how tasty it was.. All 3 of the our kids ate there whole meal and wanted 2nds.. 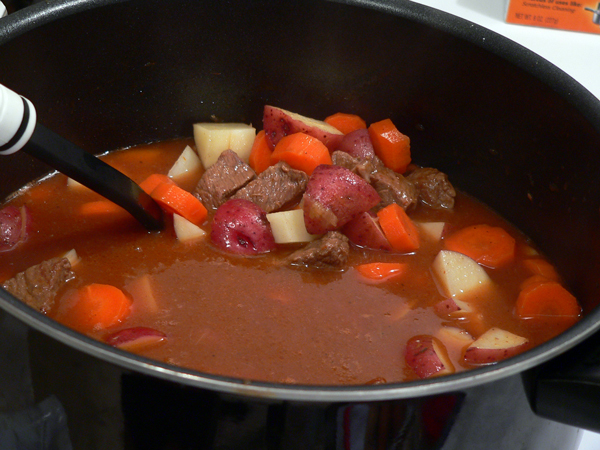 I will definitely be cooking this again..
My kids all agree…BEST BEEF STEW EVER! And they are hard to please! This is a must try recipe and you will never cook another again. Thanks Steve! I never made beef stew before. I am a single father and I stumbled across your recipie on Google. It was amazing!! My 6 year old is lucky and she loved it!!!! Thanks a lot for sharing with us and happy holidays!! WOW. I made this stew today after a quick Google search for “quick beef stew.” It is the best beef stew I’ve had. My husband said the next time we have guests, this is what he wants me to make. Thank you for sharing. The recipe is already printed and in my recipe box. I still want to try all of your recipes, but the beef stew was so good that we are making it again tonight. I have told a lot of people about tasteofsouthern.com. and I hope they are as happy as we are with the amazing recipes that you provide. Everyone owes it to themselves to try this beef stew. Thanks again. Made it again! So delicious! Love your recipes and how you take a picture and detail every step. Thank you. You make me feel like I can cook like my mom. My wife and I made two pots of this tonight, and it was absolutely amazing. This is by far the best beef stew I’ve ever had. I can’t wait to try other recipes from your website. I made this stew with all the ingredients listed except worsterschire sauce because I had run out…The smell that filled the house when the stew was cooking was absolutely heavenly…Dinner came and went and ALL 5 of my kids loved it, even my 1 year old. My husband states, ” This is the best thing you have EVER made.” Thanks to you Steve, I can cook homemade meals step by step with pictures to assist me so I do not do any more kitchen blunders. I will keep coming back to your site. I am blown away! I have more confidence in the kitchen now, so thanks so so much! Hi Amanda, Thank You for making my day. I really appreciate your comments, and I’m happy to hear the Home Made Beef Stew turned out well for you. It’s among my favorites as well. Of course, with 5 kids, I suspect you’ve been cooking some good meals a long time, but I do appreciate your compliments. I’m busy making it now and it looks/smells amazing 🙂 will let you know the outcome and my wife’s comments (shes a critic hehe) thank you Steve. I found your website when I was searching for a new beef stew recipe. Tried this last night and we loved it. It was easy to make and so good. Finished it when we got home from church today! Looking forward to trying more of your recipes. I picked up a couple of chuck roasts on sale yesterday. Today I cubed up one of the roasts and made this beef stew recipe. I have never really cared for beef stew myself. I usually find something else for me to eat. Hubby is the one who likes beef stew. Well, things have sure turned around as of this recipe! I sneaked a taste as the luscious aroma while it was cooking was tempting me. I found this to be yummy scrumptious and hubby loved it as well! This beef stew recipe will be a permanent keeper at my house for sure! Thank-You! Hi Courtney, I’m thankful you found Taste of Southern, and that you enjoyed our Beef Stew recipe enough to share it with your readers. Thank You. I appreciate your visit and hope you’ll try some of our other recipes. I have a pretty good recipe for Cole Slaw, and one for ham that I think you’ll enjoy. (Smile) What’s up with not liking those? But, you’ve got pretty good taste with your Southern Gospel Music choice. I’ve seen Brian Free in concert numerous times. Best wishes with your blog and your writing adventures. We certainly need a lot more young ladies willing to stand up for their faith, and I trust you’ll do well with your writings. It’s all in HIS time… right? I found this recipe a few months ago and I have been making it regularly ever since. We absolutely love it, even my most picky eater can’t get enough of this! I was wondering if there is a way to adapt it for a slow cooker? Would it work the same to throw everything together all at once and cook it all day long in the crockpot? Thanks for the yummy recipes! Loved this recipe. Made it last night, and we ate every last bit. I used beef broth instead of water. It was awesome! I made this along with your recipe for buttermilk biscuits and banana pudding, and all of it was gone! Needless to say, it was a hit. I will certainly be making all three of those recipes again! This beef stew recipe was very easy to follow and didn’t require a lot of preparation. Thanks for the recipe! It was A GIGANTIC HIT! I think the tomato paste makes the difference! So yummy! Thanks very much! Dear Steve, thank you for this awesome recipe. I am from Cape Town and the weather just turned cold today so I was feeling like making the family a hearty stew to at least brighten up the inside of our home. Being a 45 year old male who never made a stew before, I rushed to Google and after spending almost an hour here, I found what I was looking for. An easy to prepare, well instructed manual. Thank you for taking the time to put this together and know that in doing so, you warmed at least one South African family on a cold an wet day. I just wish you could see the surprise on my wife’s face as she walked in and found me making this! That was a priceless moment. Here is the best part,it looked exactly like yours and it tasted great. The family loved it. Thank you once again Steve! Hi Gerhard, Greetings to Cape Town all the way from North Carolina. 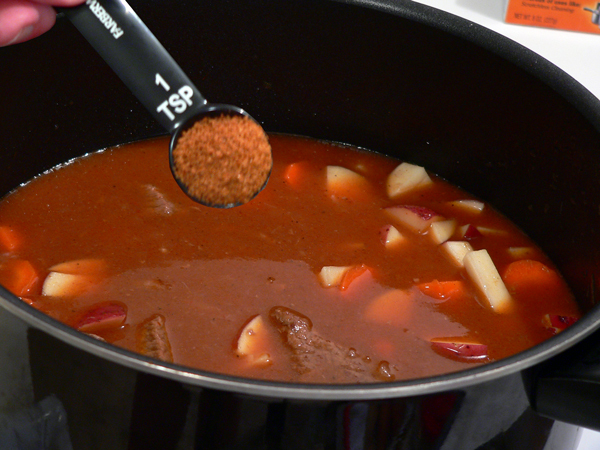 I’m thankful you found Taste of Southern and our Home Made Beef Stew Recipe. I’m delighted to hear that you tried it, and that it turned out well for you. I’m just sorry to hear you’re having some cold weather. Just bought some nice looking stew meat from a local butcher that I just won a gift card to, and I think I’m gonna use your recipe to make it tonight! It looks just like the stew my dad used to make, and I’m sure it’ll be just as good. I’ve never seen tomato paste used in stew before, but I feel like it’s going to make it even more delicious. I’m itchin’ to get started! Thanks! Stumbled upon a gold mine when I found your site! This recipe is EXACTLY what I was looking for. So pleased to make your acquaintance and I’m sure I’ll be back often. Hi Steve. This beef stew recipe looks so easy and yummy! Can you please tell me when the corn starch in your picture of ingredients is added to the recipe? Hi Dee, I think I’ve just been BUSTED. I had to go back and take a look at the recipe again to see what I left out. Best I can figure, I never actually used the cornstarch. It would go in at the last to thicken up the broth a bit, but I honestly don’t think I used any. I even looked through the photo files and don’t see where I took a photo of adding any. Thanks for asking this question! I was wondering the same thing since it was in the pic of ingredients. So I did a “find on this page” search for “cornstarch” and your question with Steve’s answer (cornstarch) came up. I like my stew broth to be thick so I was wondering if he used the cornstarch to get the thick consistency. Apparently, he didn’t need it, lol! Can’t wait to try this recipe, Steve!! I’ve just recently left my grandma’s house to start living on my own within the past two weeks and have been missing her cooking quite a bit. I’m also fairly new to the game myself (23) and so have been a bit hesitant to jump into the meatier dishes. 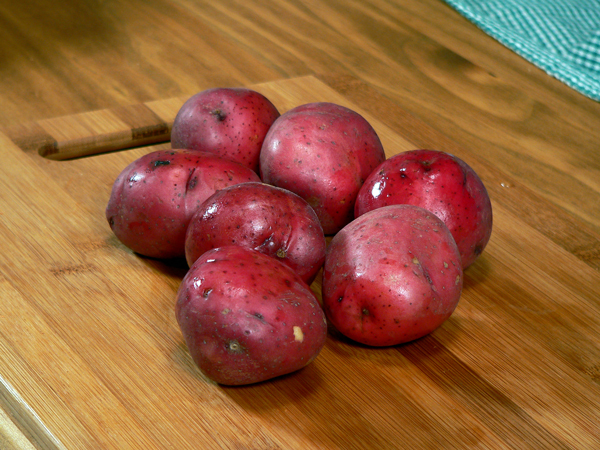 I generally have trouble balancing when to throw in onions versus the potatoes but the way the recipes are laid out on this site is very helpful! I look forward to trying this recipe either this week or next, I’ve got my heart set on the beef, gravy, and rice recipe first. Hi Pam, Welcome to Taste of Southern. I’m thankful you found our site and I wish you all the best as you head out on your own. I congratulate you also for being willing to try some of our recipes. I’m sure it’s not going to be as good as Grandma’s, but hopefully, you’ll enjoy our recipes. Just like heading out on your own, cooking can be a true adventure. Don’t give up if you don’t get it right the first time. Just keep trying, finding your mistakes, and overcome them. You can do it! I know you can. I do hope you’ll enjoy both the Beef Tips with Rice and Gravy, and our Beef Stew Recipe. The whole point of all the pictures is so you can see how the recipe should look each step of the way. I’m glad to be of help. I just trust that things are where you can still call on Grandma for some of her advice and her tips in cooking. Hopefully you can sit down with her and get some of her own recipes on paper, so you can treasure them and cook them always. Sounds like she’s a great cook and could be a great source of information. Then, maybe one day you can cook for her and show her how much you’ve learned. What do you think? Sooo good! I made this today, was very easy to follow, and everyone ate every bite! We’ve got a family of eight and it can be very tricky to please everyone!!! Hi Melissa, I’m thankful you found our site and that you tried the Beef Stew recipe. I’m happy to hear that you and the family enjoyed it. I can only imagine what it must be like to cook for a group like that everyday. Happy to know they all liked it. Just awesome loved the taste best beef stew I’ve ever tasted. I added a whole can of tomato paste ..it was too late by the tim e I read the amount to actually add. I added a extra cup of water and extra workershire sauce.. still good ! Thank you so much Steve for this absolutely DELICIOUS recipe! It is now a weekly favorite, especially now that it’s the winter time! GOD Bless! Hi GiGi, I’m thankful you’ve found Taste of Southern and happy to hear you’ve been making our Beef Stew Recipe. I’m really glad you like it. Just wish I could help you out more with this winter weather. Snuggle up… OK? Hello there, Steve! I have to tell you, I am 49 years old and I am just learning to use the computer. I was delighted to find your beef stew recipe! If I may say so, I’m impressed that I actually found what I was looking for! I am in the frozen North – BURRRR! I lived in the sunny South for twenty years and I loved every moment of it. Unfortunately, I have been in Hospitals and Nursing Homes the past 19 months. I have been on my deathbed 3 times. My family brought me home. But, God is good all the time! I have finally recovered and am looking for a place to live. Won’t be returning to the South though. I have a wonderful man in my life and guess what? He likes BEEF STEW! Thus, my search! Seek and ye shall find! I can’t wait to try your recipe. Looks heartwarming, healthy and wholesome. Just what the doctor ordered! Thank you! Keep up the great work! By the way, my Grandmother used to take me catfishing. She has passed now, but i have to tell you – she went out and pre-purchased her tombstone and it has a catfish on it! How ’bout that?! Sure enough, she had a catfish engraved on her tombstone! She picked it out herself! And if my memory serves me well, I do believe it was the picture of the catfish on the container of the Old Whiskers Catfish Bait she used to buy. It was cheese stink bait and she used to mix cattail fuzz into it to give it a more doughy texture because otherwise it would just melt off of our hooks. Oh, that used to make us so mad. What a riot! That catfish was her epitaph. No words were necessary. My goodness, if my Granmother had a dollar for every catfish she ever caught, cleaned and fried she would have been the wealthiest woman in the history of the universe! Bless her heart! Anyway, when I looked up that beef stew recipe, I saw “Taste of Southern” and went right to it. So glad I did! Thank you! God bless, and keep on cookin’!!! Hi Barbara, Can you see my great big smile right now? You made my day with your stories. YES, God IS good… all the time, and all the time, God is good. We are so blessed. You must have had a very interesting and amazing Grandmother. I’ve done some Catfishing, but have yet to skin and clean one. They put up a great fight when you hook them, but I have to bring out the gloves to take it off the hook. Where I do most of my fishing, if someone else around me wants my Catfish, I tell them they have to take it off the hook. I hear they can “sting” you pretty bad, and I don’t need any part of that. Thank you so much for your comments and for sharing your memories. I’m truly thankful you found Taste of Southern and hope you’ll enjoy the Beef Stew. Let me know if that man of yours likes it… OK? We Floridians are typically too far south to be considered part of the South- but we still have a lot of Southern traditions down here. My favorites are sweet tea and hearty beef stew! 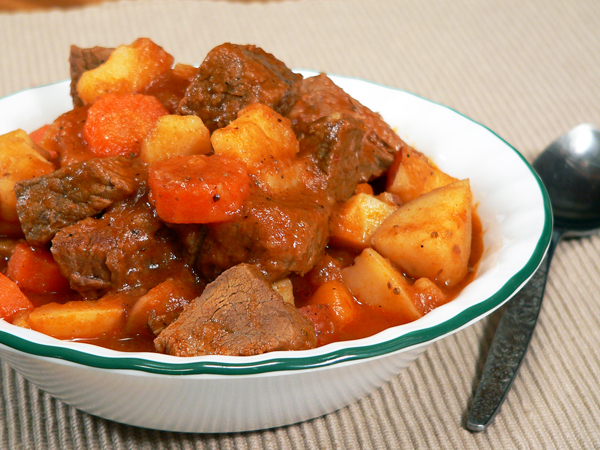 Although beef stew is often a cold-weather (and we don’t get that very much) meal, it is VERY much a comfort food. The temperature is cooling off here a little bit (and by cooling off, I mean that it’s around 68 degrees), and I had a hankering for the beef stew my grandmother used to make. She passed away long before I could learn the recipe from her, so I took to the internet to search for something that seemed similar. I found your site, liked the look of the recipe and the simplicity of the cooking process, added a wee bit of minced garlic (Garlic Fanatic #1, here), and BAM! I could be 4 years old and sitting at my grandmother’s table again. Hi Casey, I loved your story and truly appreciate you taking the time to post your comments. I’m thankful you found Taste of Southern and very happy to know that you tried the Beef Stew Recipe and enjoyed it. That always makes my day. I’m just sorry you can’t be enjoying some of our cold 28 degree weather we just got here in North Carolina. Wish I could send you some. This stew has to be the tastiest, heartiest stew I’ve ever eaten. All ingredients easily found in my parlour, and your easy to follow instructions makes it so easy to prepare and follow. Thanks for sharing. I too have passed on this recipe via a few friends and family . Seasons greetings from County Kildare. Ice storm here! Roads are closed! Been outside three hours trying to take care of split branches and recover our driveway from the broken trees and limbs. While many around us have no power, we still do. Asked hubby what he wanted to eat, he said, “hot homemade beef stew”. Happy I had a chuckeye roast in the fridge and that I found your recipe on the net! It’s cooking now and smells delicious! Thanks! Hi Deb, I do hope you kept power long enough to finish the Beef Stew. Sounds like you’re coping with the ice storm. Around here, a quarter inch of ice on the roads shuts everything down. It’s Christmas Day and 40 degrees with bright sunshine, so we’ll try to send a little of that your way. OK? I just want mention that about 2 days ago, we broke the all time high with 78 degrees. 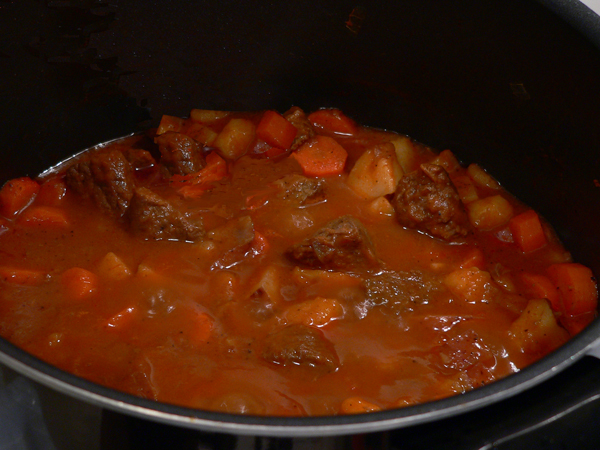 I was looking for a good, simple and easy home made Beef Stew…. I Found It!!! Heading into the kitchen now…. Thanks and Stay Blessed Steve!!! Hi Catherine, I do hope the Beef Stew recipe turned out well for you. I appreciate you giving it a try and hope you’ll try some of our other recipes. I am Blessed, just by your comments. Thank You. Hi Hazel, You’re very welcome! Thank You for trying our Beef Stew recipe, I’m glad you liked it. 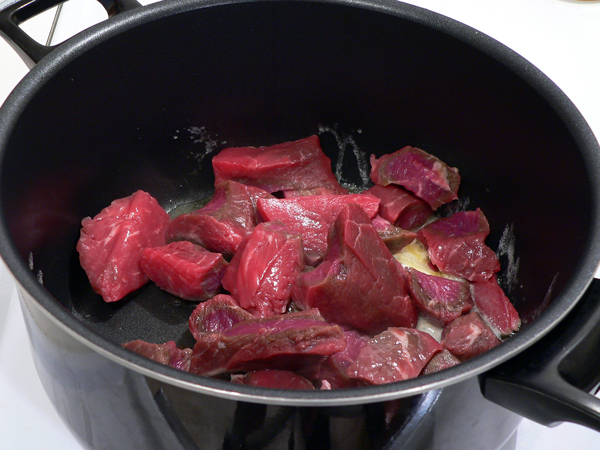 I made it with beef heart instead and it turned out great……. my wife says its the most tender beef she’s ever had (she didn’t know it was heart) and it was gone in no time. Next time I’ll have to double the recipe so I can enjoy leftovers. Hi Drew, You served your wife “heart” and didn’t tell her? You’re a brave fellow there Mr. Drew. (Smile) Happy though to hear that the recipe turned out well, and that you both enjoyed it. I promise not to tell either… OK? Nice recipe. Cooked it tonight with some rice and made a displaced southerner feel right at home. Thanks for sharing. Hi Steve! Your So Welcome, I’ve made this recipe several times since I wrote this. I was checking in bc I’m making it tonight…it’s hot out but I have ac and it’s a one pot recipe worth it!!! Thankyou again!! This is a great recipe! I have been hungry for some beef stew all week and decided to make this today. I have it on the stove now and it is almost ready… wish you could smell how good it is…. thanks for the recipe! I did make some “adjustments” because I can almost never follow a recipe without changing it a little 🙂 It tastes good! This is the first really cold day this fall, and beef stew just seemed imperative. 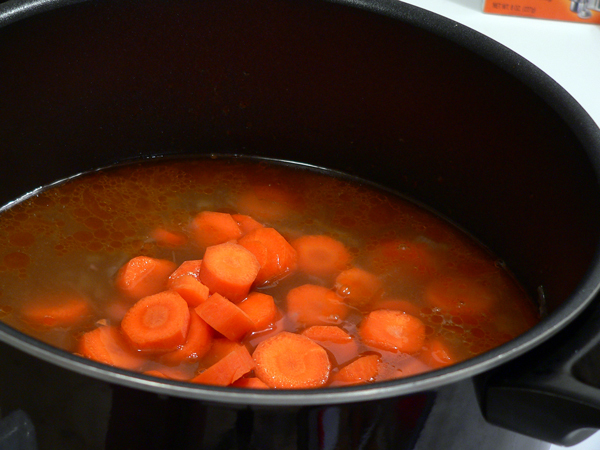 So I am waiting now for the veggies to cook–a hard task because the broth tastes so good! Thanks for sharing your recipe, Steve ! Hi Lee Ann, I hope you were ready for the colder weather. We got our first taste of it this past Friday night and I’m not looking forward to Winter. I wasn’t finished enjoying Fall yet. Hi Rhonda, Congratulations to your daughter for making it into college, I know you must be proud of her. I don’t personally think the Beef Stew is spicy. You can certainly omit any spices that you don’t like or can’t tolerate. As for the green beans, canned one’s will work and you can add them at the same time as the carrots. Ok, hands down this is my favorite recipe of yours I have tried so far!! I am actually eating some as I type this. My dad who is Alabama raised loved it. The flavors are perfect and I thank God he has laid it on your heart to share in such detail with strangers how to cook such great food. The only change I made to the recipe was the type of beef. My husband thinks stew beef is stringy so I bit the bullet and bought 2 pounds of top sirloin. A pricey meat for a stew- but oh your recipe was definitely worth the price of the meat. It is now going to be one of my staple recipes. (Btw I had the exact same plates and bowls you served your meal on in these pictures so I knew this recipe was for me :-). Lette, I like the way you think. See a plate and bowl like you have yourself and it’s the right recipe. How cool is that? I’m glad you tried the Beef Stew Recipe, and the top sirloin sounds like a good change. Very glad to hear that your dad loved it, and I hope your comments of approval will encourage someone else to give it a try as well. Cornbread goes really well with this by the way. Followed the recipe. And my family loved it!!! 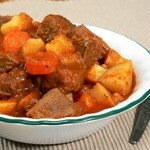 Hi Linda, Thank you for sharing your comments and I do hope you will enjoy the Beef Stew Recipe. I’m afraid 97 degrees around midnight is a bit too warm for me, maybe things will cool down soon for you. We have two large lakes near where I live. I pretty much only fish just one of them and haven’t been able to do as much of it as I’d like to have done this summer. I’m a big fan of Crappie. I love to fish for them, love to catch them and really enjoy eating them. We also have catfish, large mouth bass, bluegill and some perch along with a few others. Im not a cook at all, never have been but I followed this recipe to the tee and it came out delicious. I ended up making a big ole pot of it for my uncles birthday and there was nothing left of it when it was time to go home…lol! Im actually making a pot of it right now for me and my father. Thanks for putting this recipe online for everyone to enjoy….take care. How tender is the meat for this stew? Seems it may be tough being that it is cooked for 2 hrs only. I have a person Im cooking it for, an older man and, is very specific that the meat be tender. I am making this tonight…can’t wait. It is freezing here in Indiana today and this reminds me of being a kid and coming in after playing outside to a piping hot bowl of stew and cornbread. Thanks! Have a blessed day. Howdy Steve, I just made a big ole pot of this stew ….I loved it, my kids loved and, most important…its a great left over for the next day … I’ll be making this often sir…as well as trying other recipes from you!! Hi Steve! I was looking for a simple but good beef stew recipe. I gave yours a try and it was very good! My family loved it! I will be trying more of your recipes. Steve, I came across your website late last night while looking for an easy quick recipe my family would love! Well Steve you did it. I have two young children an I was able to make this during nap time an its so delicious my husband went back for thirds LOL, so I just wanted to say Thank you an God bless I made enough to have some after church Sunday also. I will be coming back to try more recipes. WoooHoo…. I am making this tonight! I just happened across the site… I love it! Seems like a wonderful “real” stew, thanks for sharing! Also, thanks for the little back story too… Makes the food sound all that much better! Have a great day! Makes me want to go and try it right now. I made the beef stew today and it came out so good! Excellent. My mom who is 93 yrs old said it is delicious. Im actually cooking it right now and can’t wait to try it!